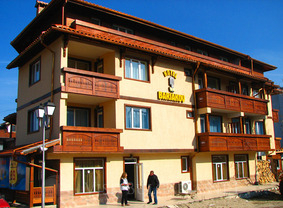 Baryakov Family Hotel in Bansko ski resort in Bulgaria. Location: Baryakov family hotel is situated 150 m from the Gondola ski lift in Bansko ski resort and 850 m from the centre of the resort. Accommodation: The hotel offers 15 double rooms and 3 studios. The rooms feature bathroom with hydrojet bath-tub or shower cubicle, heating, mini fridge, TV SAT, phone, Internet access (Wi-Fi), bath-tub or shower, hair-drier, working desk. 9 of the rooms feature sunny balconies with view to the mountain. Bars and restaurants: The hotel offers lobby bar and typical Bansko style restaurant - mehana where thematic evenings and wine tastings are organized. Sports and leisure: The hotel offers sauna, massage, table tennis, ski and snowboard depot, ski and snowboard school, children's sledge rent (free of charge). Business services: At business guests disposal is conference hall with mobile sound system, multimedia, screen. Facilities: Room Service, Safe at the reception (free of charge), Wi-Fi internet (free of charge), Credit cards (Visa, MasterCard, Maestro), Rent-a-car, Parking (free of charge).